Today a very big congratulation to all the members that win the 1st prize or 3rd prize from receiving our SMS 4D number. 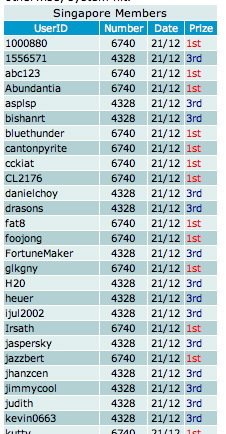 There are 52 members received our top prize number!. These numbers are specially selected with the use of our Win4D Advance software. Just in case you do not know how the SMS 4D are been disseminated, I will explain this here again. We will analyze and select about 15 set of most probable winning 4D numbers for next draw. These are base on our experience and our view so in no way they are guarantee sure win numbers. We assign these into the database, the computer will then randomly select a set of 4D number from this group for each member. It is then schedule to deliver to members on Tuesday, Friday and Saturday respectively. For Malaysia members, special draw will also get to receive. You may want to have more numbers beside the one you received, not to worry, you can also get more at the Special forecast numbers section when you login to the Webpage. Usually about 5 or 6 sets of additional 4D numbers are shown there. Do join Gold membership to receive this number every draw. If you are already a Silver member, you can upgrade by paying through ATM transfer or Internet transfer to our POSB saving 319-01480-2 and then SMS 92300837 to inform us. We shall activate you membership within 10 minutes.